The Cool Loom Kit has 3 columns of 13 pegs tied together with 4 base units to create a cluster of 39 pegs. Additional looms can be combined either end-to-end, or side-by-side to create a larger work area. 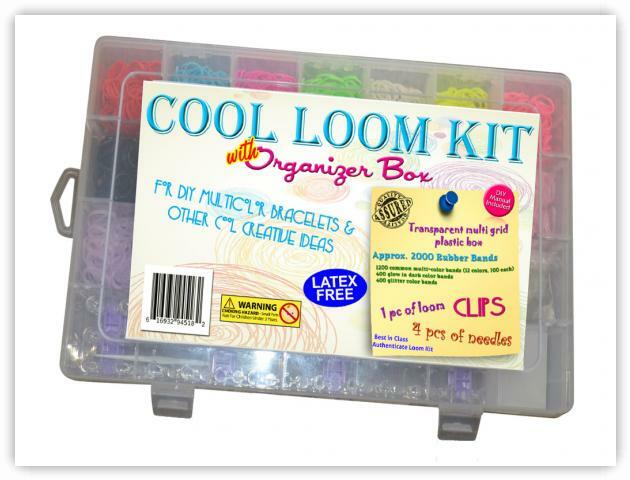 The kit comes with the Loom, 4 Loom Tools or Pins, 1200 multi-colored Bands (12 colors of 100 each), 400 Glow-in-the-Dark Bands, 400 Glitter Bands, 200 Glow Bands, Clips, all stored in its own nice plastic Organizer box.